PARIS 2e: Hôtel-Dieu: A bit of Morbid Curiosity? 1 Comments Published by Cedric Benetti on Sunday, August 12, 2007 at 8/12/2007 11:44:00 PM. On Sunday I ventured into the vaults of the Hotel-Dieu of Paris. 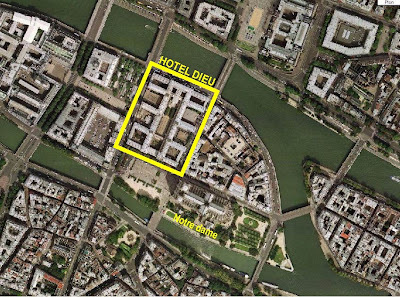 This hospital was founded in 651 AD by Saint Landry, and is the oldest hospital in Paris. It was the only hospital in Paris before the Renaissance, and still resides on the Ile-de-la-Cité. The current building dates back to 1878 as it had to be rebuilt after the old structures were destroyed in a fire on numerous locations. The building itself is a perfect example of the preoccupations on hygiene of the 19th century, and represents a "ventilated" architectural type with lots of wings and courtyards. The building is fascinating since it hasn*t really been renovated and some parts just look like a hospital in the slums. In many old high ceilinged rooms, functionalism of a more modern age took over and put in second floors and wiring. The endless hallways creep you out, and sometimes there are doors open that should better be closed (I once nearly got into an ER while searching for a coffee vending machine). You can openly wander around the magnificent open courtyard with its arched hallways, leading you up to the huge chapel structure (unfortunately closed). Also don*t come here for emergencies, unless you have time to kill! I once spent a whole afternoon here with Haily, when she cut open her hand. We had fun fun fun and lots of hysteric patients screaming and unconscious people staring at you in a braindead way... Man I love this place! Feeling tired? Wanna lay down a bit? Who knows where you may wake up. The waste disposal room! I went in there... found no body parts whatsoever... not even a prolapse! Sweet mother Mary! What the hell are you doing here? Too bad, I couldn*t visit!